Western blot analysis of extracts from HeLa cells, transfected with 100 nM SignalSilence® Control siRNA (Fluorescein Conjugate) #6201 (-), SignalSilence® Bcl-2 siRNA I (+) or SignalSilence® Bcl-2 siRNA II #6516 (+), using Bcl-2 (50E3) Rabbit mAb and α-Tubulin (11H10) Rabbit mAb #2125. Bcl-2 (50E3) rabbit mAb confirms silencing of Bcl-2 expression, while the α-tubulin (11H10) rabbit mAb is used to control for loading and specificity of Bcl-2 siRNA. CST recommends transfection with 100 nM SignalSilence® Bcl-2 siRNA I 48 to 72 hours prior to cell lysis. For transfection procedure, follow protocol provided by the transfection reagent manufacturer. Please feel free to contact CST with any questions on use. 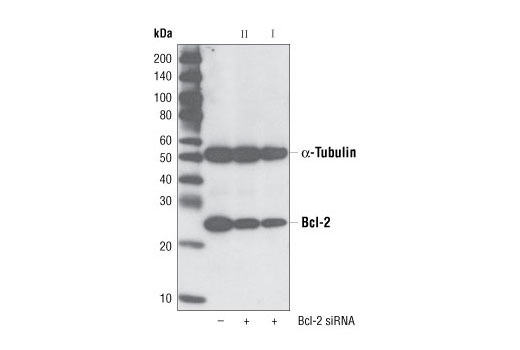 SignalSilence® Bcl-2 siRNA I from Cell Signaling Technology (CST) allows the researcher to specifically inhibit Bcl-2 expression using RNA interference, a method whereby gene expression can be selectively silenced through the delivery of double stranded RNA molecules into the cell. All SignalSilence® siRNA products from CST are rigorously tested in-house and have been shown to reduce target protein expression by western analysis. Bcl-2 exerts a survival function in response to a wide range of apoptotic stimuli through inhibition of mitochondrial cytochrome c release (1). It has been implicated in modulating mitochondrial calcium homeostasis and proton flux (2). Several phosphorylation sites have been identified within Bcl-2 including Thr56, Ser70, Thr74, and Ser87 (3). It has been suggested that these phosphorylation sites may be targets of the ASK1/MKK7/JNK1 pathway and that phosphorylation of Bcl-2 may be a marker for mitotic events (4,5). Mutation of Bcl-2 at Thr56 or Ser87 inhibits its anti-apoptotic activity during glucocorticoid-induced apoptosis of T lymphocytes (6). Interleukin-3 and JNK-induced Bcl-2 phosphorylation at Ser70 may be required for its enhanced anti-apoptotic functions (7). Silencing Bcl-2 expression by RNA interference induces p53 dependent apoptosis (8). Murphy, K.M. et al. (2000) Cell Death Differ 7, 102-11. Zhu, L. et al. (1999) J Biol Chem 274, 33267-73. Jiang, M. and Milner, J. (2003) Genes Dev 17, 832-7.